Solomon and Jenny Cohen emigrated from Lithuania to Montreal in 1905, where he worked as a plumber and electrician. 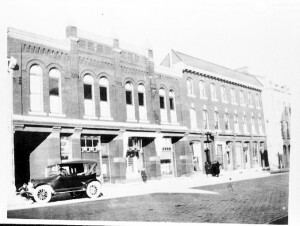 In 1916, they moved to Kingston and operated a small grocery and confectionary at the corner of Ontario and Johnson (which also served as their home; now it is a parking lot). As was the pattern for many immigrants of that generation, they took on a boarder to help defray expenses. According to Beth Israel’s congregational history, his name was Alex Glazer, and he was a wholesale fish buyer. Jenny also ran a dance hall throughout the 1920s and 1930s. The Garden Dance Hall (later The Paramount) opened in 1919. As was the case with most Jewish women living in Kingston at this time, she was also an active member of the Beth Israel Synagogue and participated in the local chapter of Hadassah-WIZO, a women’s Zionist organization. The Garden Dance Hall was an important site for Kingston’s Jewish and non-Jewish populations, since many community events were held here. Jenny offered dance lessons in her studio, arranged ballroom events in the evenings, and organized benefit dances. The dance hall was made available for simchas (celebrations) such as weddings and bar mitzvot. She extended her hospitality to the greater Kingston community as well, welcoming university students, soldiers, firemen, and policemen to hold their events in the hall. The Garden Dance Hall closed its doors in 1938.